DUSU Election Result 2018, Delhi University President Election Result 2018 Highlights: ABVP's Ankiv Basoya, Shakti Singh and Jyoti Choudhary have won the posts of president, vice president and joint secretary respectively. NSUI's Akash Choudhary has won the post of secretary. DUSU Election Result 2018 Highlights: The results of the Delhi University Students’ Union elections are out. ABVP’s Ankiv Basoya, Shakti Singh and Jyoti Choudhary have won the posts of president, vice president and joint secretary respectively. The secretary post went to NSUI candidate Akash Choudhary. The counting day remained in the middle of news for all the wrong reasons as some contesting outfits complained about faulty EVM’s. The counting, which began at 8 AM on Thursday, was suspended after members of NSUI and CYSS complained about EVM malfunction in some stations. The counting resumed following the contesting parties mutually agreed to take the process forward. The result of the Delhi University election will help major parties understand the mood of young voters ahead of the 2019 Lok Sabha elections. A member of the Congress-backed National Students’ Union Of India (NSUI) said the DUSU elections are like the “semi-final for the Lok Sabha elections” and will show what the young, educated voter wants. A member of the RSS-affiliated Akhil Bharatiya Vidyarthi Parishad (ABVP) said the election results will help the general public and the media to draw a conclusion on the mood of voters and also give an idea of what is the trend in national politics, reported PTI. Winning the post of president, MA Buddhist Studies student Ankiv Basoya got 20,467 votes. NSUI’s Sunny Chillar lost to Basoya by a margin of 1,744 votes. Last year, NSUI had won the post by a margin of 1,590. The DUSU Election counting for five hours on Thursday after a fault in the display of one EVM was reported and students alleged that the machines were rigged. When the counting was stopped, NSUI was leading on two seats — president and secretary. There were reports of EVM malfunctioning and allegations of tampering in the Delhi University students’ union election, the office of the Chief Electoral Officer (CEO) in Delhi said that the machines used in the polls were not allotted by the Election Commission and were “procured privately”. ABVP’s winning margins are larger this year, while their vote share has also increased to 33.04 per cent from last year’s 30.13 per cent. Likewise, the NSUI’s vote share also increased from 29.04 per cent to 29.48 per cent. Though it was expected to be a three-cornered fight between the ABVP, NSUI and the joint panel of the All India Students’ Association (AISA) and AAP’s Chattra Yuva Sangarsh Samiti (CYSS), the fight was squarely between the ABVP and NSUI. All those day-dreaming at the prospect of defeat of @ABVPVoice in #DUSUElection2018, must be crest-fallen with #DUSUresults. This is, they must note, a solid reaffirmation of mood of the nation - which is Modi-May all the way! Nand Kishore Yadav, who is serving as cabinet minister of road in the Bihar government tweeted congratulating three of the ABVP members for securing positions as President, Vice President and Joint-Secretary in the Delhi University Students Union elections. He also extended his greetings to all ABVP members and workers, as well University students. The Delhi BJP termed Thursday the victory of ABVP candidates in the Delhi University Students' Union (DUSU) elections as the victory of youth in the country, even as the AAP and the Congress held EVMs responsible for their defeat. BJP leader and Union minister J P Nadda congratulated ABVP's winning candidates and said students' power is the 'strength of the nation'. Delhi BJP chief Manoj Tiwari said the ABVP has showed the BJP will also win the 2019 Lok Sabha polls under the leadership of Prime Minister Narendra Modi. "The victory of the ABVP is the victory of each youth in the country. The government has implemented schemes like the Skill India programme for better future of the youth. The BJP will form the next government under the leadership of Narendra Modi," Tiwari said. 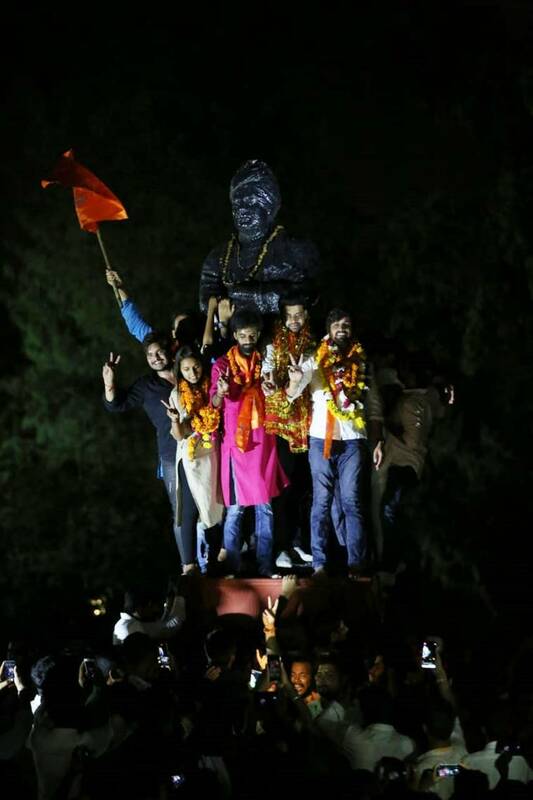 ABVP greeted three of its candidates for their victory in the Delhi University Students Union Election. ABVP candidates Ankiv Basoya, Shakti Singh and Jyoti Choudhary have won the posts of president, vice president and joint secretary respectively. NSUI candidate Akash Choudhary has won the post of secretary. The results of DUSU elections are out. ABVP has won the president, vice-president and joint secretary posts while NSUI has won the secretary post. Moreover, making unfounded allegations on ABVP for a faulty machine is unacceptable. National General Secretary, ABVP Ashish Chauhan said that NSUI is making unfounded allegations. In a statement, the NSUI said, "NSUI was winning the DUSU election after six rounds when the EVMs magically started malfunctioning. One EVM showed votes on secretary post on ballot number 10 when there are only eight candidates. EVM also showed zero votes for NSUI candidate. It is clear that any further counting on these EVMs has no credibility and we demand that our candidates are declared winners immediately." While NSUI has raised objections alleging tampering with EVMs and demanded re-election, the counting will begin in a short while. A total of 10 rounds of counting is still left. The counting was initially stopped for an hour after the allegations of faulty EVMs surfaced. However, following objections by the students, the election officials decided to suspend the process. "The polls are being held at the behest of the central government. The EVMs were tampered with. We want fresh elections," Rocky Tuseed of the National Students' Union of India (NSUI) said. 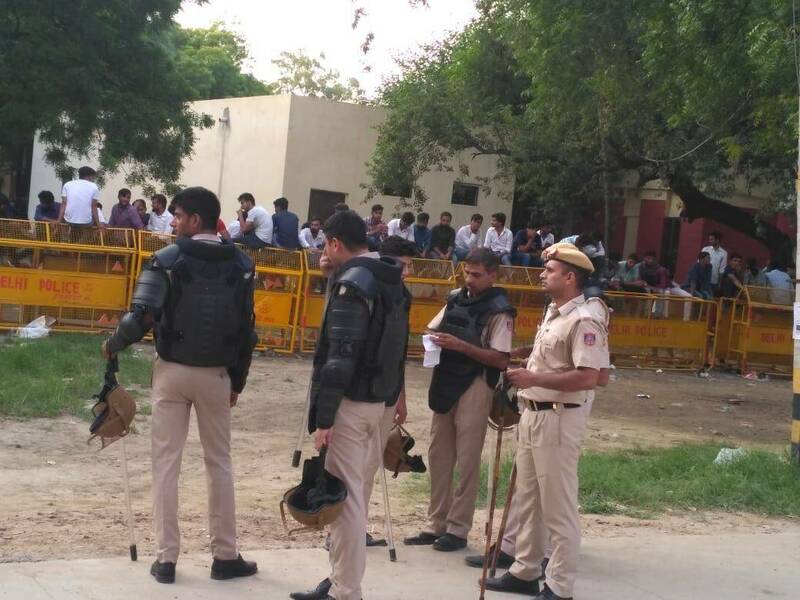 Heavy police force was deployed in the area, with around 700 personnel stationed in the north campus and over 500 personnel deployed in the south campus. A person wearing a question mark sign was detained by police outside the Ramjas College, but after it was found he had a college ID card, he was let off. Some members of parties, who were seen canvassing for votes, were warned by the police personnel, reports PTI. Amid heavy police presence and some last-minute attempts to woo voters, the Delhi University Students' Union polls went off peacefully with around 44.46 per cent voter turnout till 7.30 pm on Wednesday. Polling took place at 52 centres in the colleges, where as many as 1.35 lakh voters have been involved in deciding the fate of 23 candidates in the DUSU polls. Last year, the election saw a 43 per cent voter turnout. The results will be announced on Thursday, reports PTI. The student wing of Congress, NSUI has alleged technical glitches in EVMs. After the sixth round of DUSU elections, NSUI is leading for the posts of President and Secretary, while ABVP for the Vice President post. The final results are expected to come around 3 pm, as ten more rounds of counting are still left. 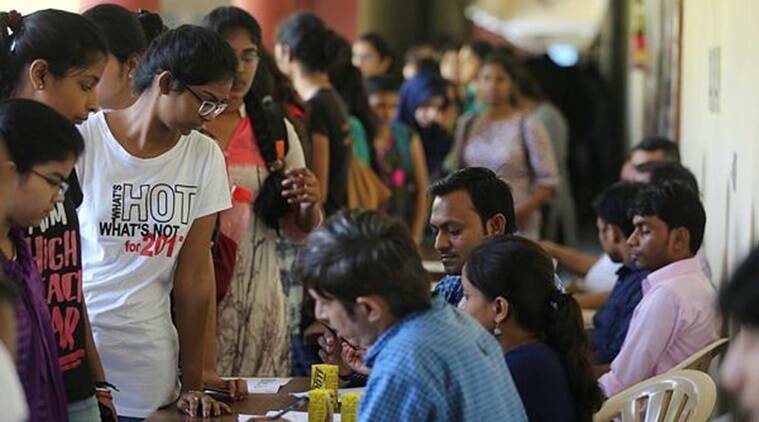 Party members making a last-minute pitch to students, excited first-time voters and heavy police presence set the ambience on the Delhi University Students' Union polls Wednesday. Over 1,200 police personnel were posted across North and South Campus areas to ensure no untoward incident was reported. In North Campus, 700 police personnel, including 100 women personnel, were deployed since early morning. Senior officers were also seen checking the arrangements, reports PTI. After the AAP came to power in Delhi in February 2015, its students wing had unsuccessfully contested the DUSU polls. This time, it has promised installation of CCTV cameras, setting up of police booths in the campus, ending the "culture of hooliganism" and opposition to "commercialisation of education"
While the NSUI has promised the 'Institute of Eminence' tag for Delhi University and thalis at Rs 10 in canteens, the ABVP has promised to spend 50 per cent of the union's budget on women and social justice-related activities, along with a special attention on promoting sports and installing sanitary pad vending machines in college campuses. DUSU Election Result 2018 Highlights: Congress-backed National Students’ Union of India (NSUI) has assured students of the “Institute of Eminence” tag for Delhi University and thalis for Rs 10 if it wins the election today, while the Akhil Bharatiya Vidyarthi Parishad (ABVP) will spend 50 per cent of the union’s budget on women and social justice-related activities, along with a special attention to promoting sports and installing sanitary pad vending machines on college campuses.